Visa Inc. announced new product details surrounding digital identity on October 22, 2018 in preparation for a first quarter 2019 launch of Visa B2B Connect. This one-of-a-kind distributed ledger-based platform is designed to give financial institutions a simple, fast and secure way to process cross border business-to-business payments globally. B2B Connect’s digital identity feature tokenises an organisation’s sensitive business information, such as banking details and account numbers, giving them a unique identifier that can be used to facilitate transactions on the platform. Encompassing safety, security and governance all in one solution, B2B Connect’s digital identity feature will transform the way information is exchanged in business-to-business cross-border transactions. In preparation for the commercial launch in 2019, Visa is expanding partnerships to add additional functionality to the B2B Connect platform. 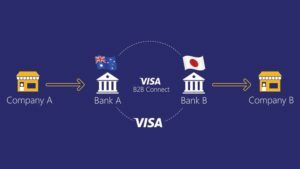 As part of the B2B Connect platform, Visa is integrating open source Hyperledger Fabric framework from the Linux Foundation with Visa’s core assets. This will help provide an improved approval process to facilitate financial transactions on a scalable, permissioned network. The work between Visa and IBM will enable our mutual financial institutional clients and ecosystem to maximize the network. Building on a 40-year relationship between Visa and IBM, this is a natural progression that highlights both companies’ commitment to ensuring a frictionless cross-border payment experience with the utmost security, trust and transparency. Bottomline Technologies, a leading provider of financial technology that helps make complex business payments simple, smart and secure, is working with Visa to be the first partner to integrate its solution with B2B Connect. With the integration, Bottomline’s financial institutions who participate in B2B Connect can gain easy access to the B2B Connect platform, without requiring complex technology updates.